Love note we made at the first monthly meeting of Open Heart Studio troop #1. Laminated and with strings ready to put anonymously into the world to promote love and peace one person at a time! OPEN HEART STUDIO troop #1 –Promoting civil discourse one LOVE letter at a time. Mission: To reveal our common humanity via Random Acts of Love, through the vehicle of art. No politics, no religion, just a common need to receive and give love. What: Make a love collage on one side of a 4×6 card, write a simple note such as “YOU ARE LOVED, pass it on”, laminate the card add a string on top place them randomly and anonymously in the world. That’s it! Short Term Goal: To brainstorm the idea with you and make some love notes and send them out in the world. Long Term Goal: Meet monthly to make collage cards and set them loose in the world. Encourage others to start their own OPEN HEART STUDIO troops. Dreams: To have a mobile Open Heart Studio van filled with collage items and everything needed to make a R.A.L. card…go to scout meetings, schools, churches, synagogs, mosques, town meetings, have a booth at farmers markets, a stand outside of Congress, at the U.N.….oh yeah and achieve world peace! Inaugural meeting of Open Heart Studio troop #1 – thanks to Kate, Sonia and Jack for joining me on a rainy Thursday night to MAKE LOVE happen! I don’t have a facebook page or a website or any of that right now just an idea and a hope for a more loving, accepting, helpful, peaceful world. I will keep you posted on my progress. Maybe you want to start your own Open Heart Studio troop. Yours can be troop # 2! 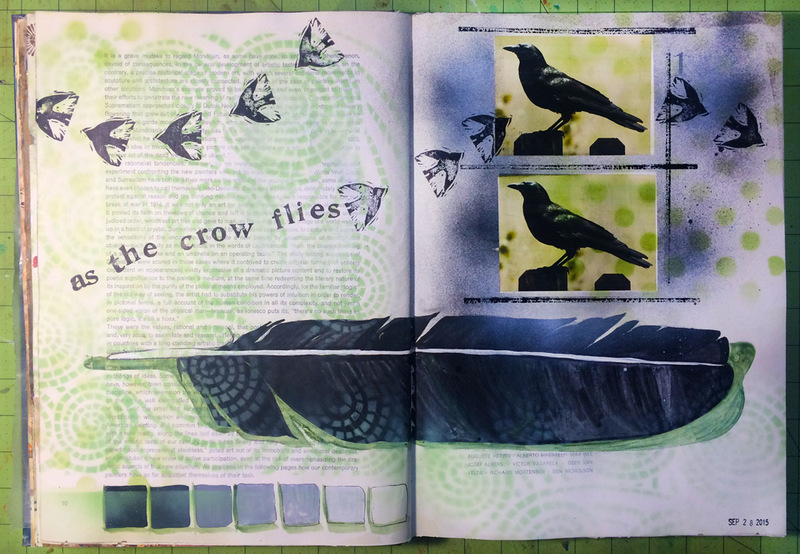 A page from my mixed media Art Journal – pondering the meaning of life and other heady things! It was my birthday on Sunday and, no surprise, I have been thinking a lot about the passing of time and this metaphor has been rolling around my head for the past five days, so I thought I should share it with you. On the day I was born the archer pulled the string back on the bow and the arrow that is ME shot forth into the world. The arch of the arrow is unknown, the distance too and wherever that arrow lands, well that is it’s true mark – and not for me to know. I sooth myself by thinking I have control over those two factors – arch and distance – and perhaps I do to a little bit. My efforts can take me higher and perchance farther but there is capriciousness too, that is out of my control. And as I think about it, it is just that fickleness that is the true gift of life. In not knowing the arch and distance of my arrow, in understanding that I can not control all factors I can give over to the goodness and wonder before me – right here, right now. It is all there ever was, is, or will be. I give thanks to the archer for sending my on my path, I give thanks for the past 54 years and I give thanks for today – that will have to do. I came upon a dead crow the other day while walking my dog. At the scene there were no feathers strewn about no sign of a struggle so maybe it was just this crow’s time. I kept thinking about that crow and its kind, about crow life and community, crow work and pleasure. Where I live crows have found a niche, they forage and hunt, they crack walnuts and acorns by dropping them on the road from high up in trees- I’ve seen this myself- clever critters. They heckle and pester the birds of prey like the hawk and owl that live in the trees near by. At dusk they seem to gather together in community in a big oak tree between us and the dairy next door, later they fly off to roost for the night somewhere else, our oak tree seems more like stopping by the pub after work to chat with friends. I don’t really know much about a crows life but I do know that anytime I’m asked what superpower I’d want if I had one I always say flight – and whenever I ponder a next life, if there is a next life to be had, I think please let me be a bird. And not a humming bird (too busy) not a woodpecker (hard headed) I don’t think eagle or even hawk is in my future (too noble) – although the crow is much maligned, I think a crow would suit me fine- clever and social, a little bit pesky, but interesting and a fine flyer defiantly a fine flyer. So if the universe is listening I wouldn’t mind seeing for myself how to get there as the crow flies! 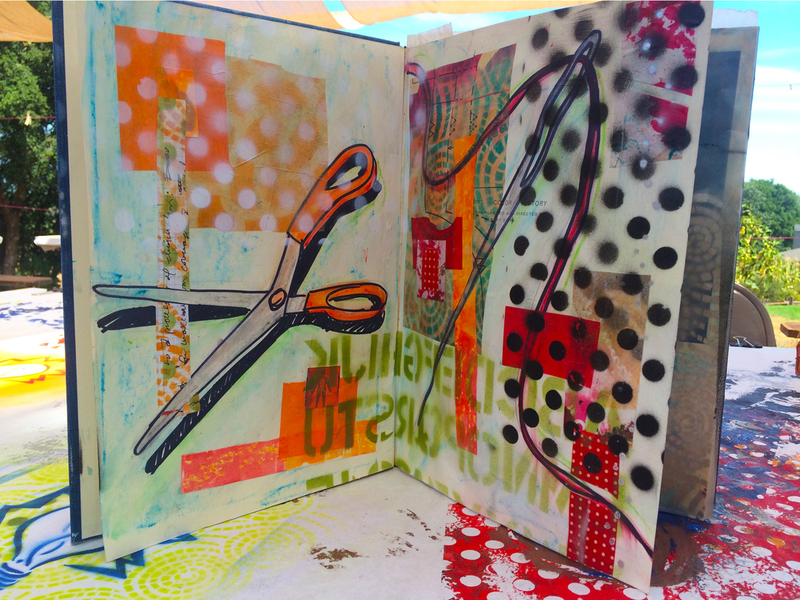 Ode to ordinary objects, in my new art journal that I started yesterday! Well summer is waning, don’t say it I know what your thinking “but it’s not even Labor day yet!” – true enough but for me – here – ordinary time has begun. School is back in session and I back to my classroom of kiddles, summer camps are over here at The Bishop’s Ranch, and summer visitors have all come and gone, my son is back at college. For me this is a perfect time to make some resolutions – create new habits, and get into gear with the habits I let slide in the extraordinary days of summer. So I’m back to my yoga class and morning hikes, I’m back to my breakfast of oats and quinoa and now I am adding flossing every day – I know what you’re thinking “she doesn’t floss everyday?” I confess I don’t and I’ve been lying to my hygienist for years but this week I have flossed every day! More importantly I have decided I want to meditate every day – a bit of flossing of the mind if you will- loosening of the flotsam and jetsam that clogs the mind and gently pushing it out. I have set the bar low to start I have been meditating 10 minutes a day. I figure if I can start that habit and prove to myself that I have the time then I will stretch it out longer as the fall progresses. I have to say I feel it, my teeth and gums are vibrant and happy and so is my spirit – things feel less stressed less pressing… Ok I know it’s only been a week but really It’s good – I’m keeping this habit. To commemorate the opening days of ordinary time I decided to start a art journal. I haven’t really done one – I have a sketchbook that is more about ideas and inspirations but just quick notes and scribbles. I found this 1960’s art book- that was titled “Modern Painting, Contemporary Trends”. The pages are nice and thick and not glossy at all. If you can believe it the color art photos are pasted in individually! Anyhow I lightly gessoed up some pages and decided to do something…. I remembered my thoughts about the return of ordinary times and decided to depict ordinary objects. My eyes landed on my scissors and a sewing needle. So here it is the first two pages in my art journal (pictured above) I used pencil, marker, watercolor crayons, tissue and other papers from my stash with some matte medium over the top – Oh Yeah and of course as you’ve probably noticed my favorite obsession, I did a little spray painting with stencils too. I promise to show you more as ordinary time continues! 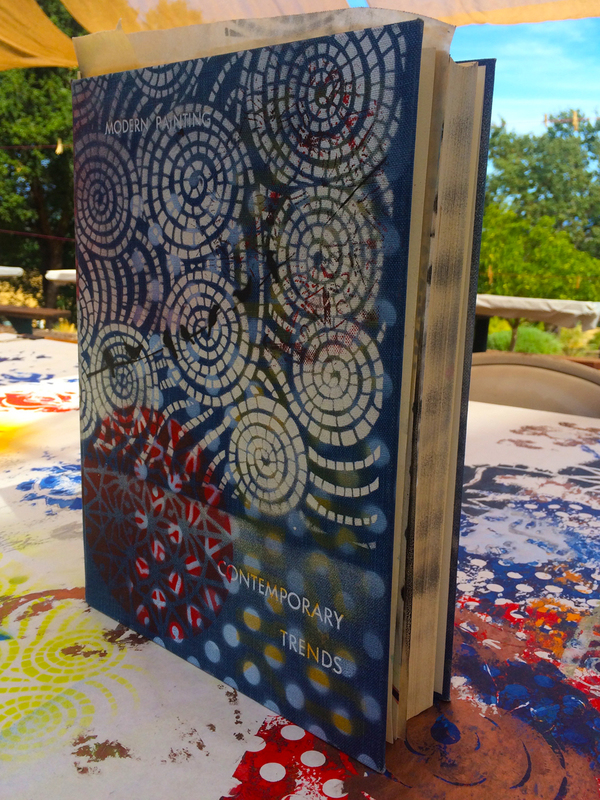 1960 art book “Modern Painting – Contemporary Trends” spray painted of course! I taught and encaustic collage workshop this weekend and because it was a small group I was able to set up a work station and do some creating also! And because it was a small group I decided to share with them an encaustic technique that I’ve been exploring that combines paper collage and the encaustic wax with the spray paint techniques I’ve been using with fabric. It was a lot of techniques for them to wade through but they had the time and space of the whole weekend and the lovely, supportive hospitality of the Ranch to allow them to create and explore. 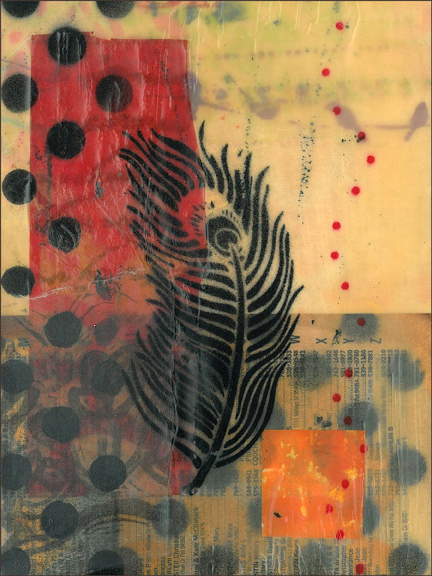 One of my students has worked extensively with encaustic but not so much with collage and she shared some techniques and tools she has picked up along the way, including using silk in her pieces. I was inspired by what she had done and got out some silk organza I had stenciled a few weeks ago. It acts a bit like tissue paper would be gives a different texture that is lovely. 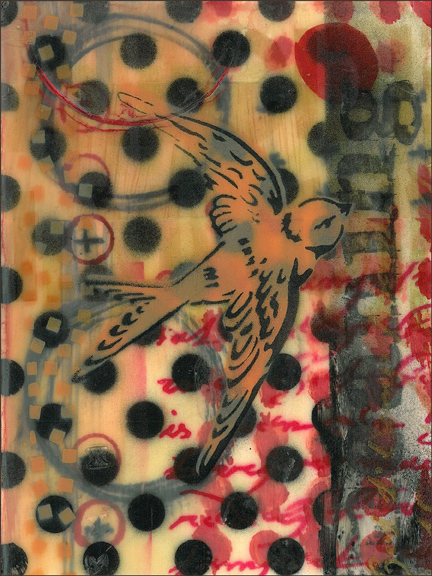 Combining the collage techniques with the stencils spray paint on the encaustic creates an amazing effect. Each thin application of wax is a distinct layer. 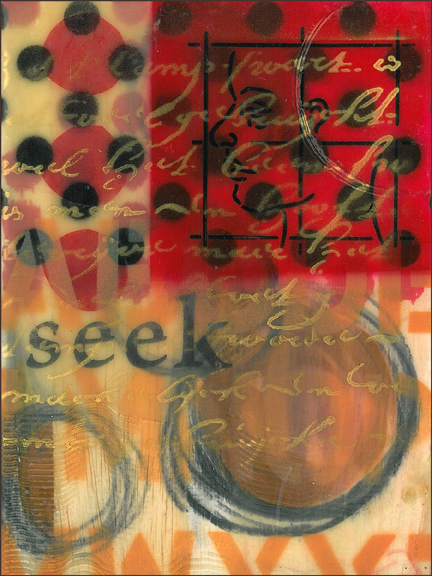 In these examples I have both spray painted and glued papers to the base wood, then applied a layer of encaustic wax – stenciled pattern with spray paint on that then add tissue paper or silk organza that had stenciled patterns and images. All these thin layers of pattern and color creates a piece full of depth and intrigue. I hope to play around with all these mediums more this summer, combining and sharing what I know and gathering new ideas from others willing to share. A montage of some of this weekends partipants. I lead a great workshop this weekend here at The Bishop’s Ranch. It was a wonderful weaving of words and images, to create both visual and verbal poetry. I worked with writer and poet Laurie Glover, and we took turns guiding the group. I had laid out bins of papers, books, photos, cards all kinds of visuals I have gathered over the years. I had everyone choose between 15-20 pieces, I encouraged them not to judge or plan just pick up what ever they were drawn to and not question it. Then they edited those down to 10 things. Laurie then led them through the first stages of writing the poem using the images as the starting point. She had everyone write a list of ten simple lines jumping from the images such as “I am a cloud”, or “I am the grass” then the list was rewritten with a verb and again with an adjective and then a prepositional phase. We wrote our list of lines right on the white paper covering the table to keep it from being too precious. We circled favorite lines then Laurie led us in arranging them in the pantoum form. A pantoum is a form that originated in fifteenth century Malaysia and prescribes a certain order and repetition of lines. Intermingled in writing of the poem I guided people through making the collage pages using some of the images gathered, adding, pockets, and curtains and embellishments to make a rich visual to go with the rich writing. 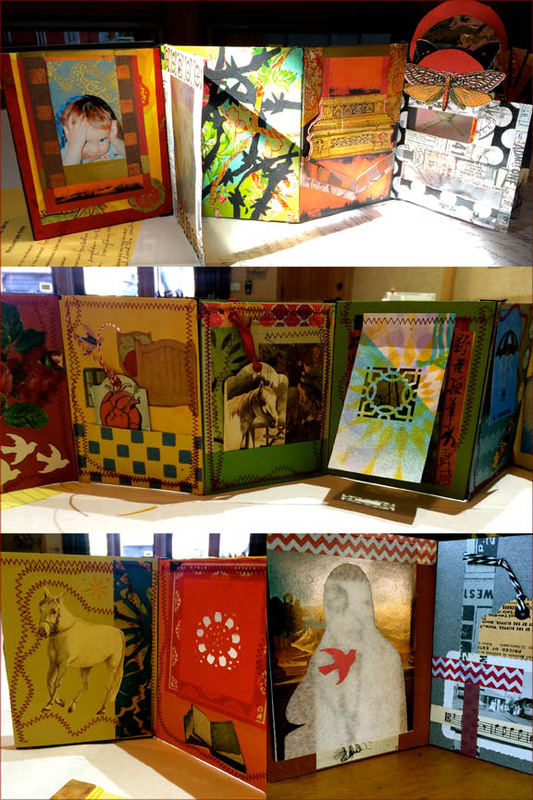 Each person emerged with a 4-8 page accordion book of collage pages with an accompanying pantoum poem. It turned out to be a wonderful almost magical process. It was lovely to see each person’s poem book emerge. 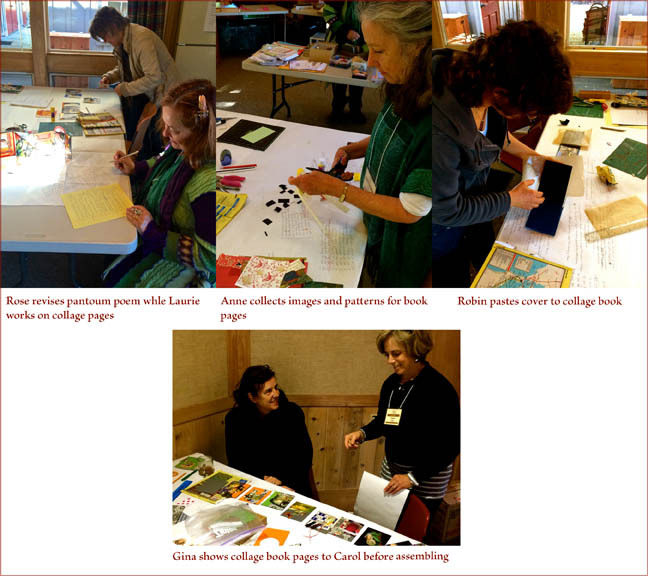 Above are some of the fourteen people gathered in a creative flurry this weekend, below are some of the books and pages that emerged. I wish you could see them in person. We plan to offer it again so maybe you can come next time! Just a small collection of the wonderful works that emerged this weekend.